1. Remove the goose from the fridge 2 hours before cooking to allow the skin to air-dry. Preheat the oven to 190˚C, gas mark 5. To make the stuffing balls, heat the butter in a pan over a medium heat. Add the onion and celery; sweat for 10 minutes until translucent. Add the garlic and fry for 2 minutes. Remove from the heat and leave to cool. Take the sausages out of their skins; put the meat into a large bowl with the remaining stuffing ingredients. Add the cooled onion mixture, season, then thoroughly combine with your hands. Shape into 4cm balls (making about 24). Put on a baking tray lined with baking parchment and roast for 25 minutes. Turn the balls and cook for a further 15-20 minutes until crisp and golden; set aside. 2. Increase the oven temperature to 210˚C, gas mark 7. Trim any excess fat from the neck of the goose and any pads of fat from the inner cavity; remove the giblets. Put the onions and carrots in a large, high-sided roasting tin. Put the zested lemon halves and thyme in the goose’s cavity. Mix the lemon zest with the salt and plenty of black pepper; use to season the whole bird. Sit on top of the vegetables; roast for 20 minutes. 3. Reduce the oven temperature to 180˚C, gas mark 4, and cook for around 1 hour 30 minutes, until the juices run clear when the leg is pierced and no pink meat remains. (If not yet cooked, return to the oven and check every 15 minutes.) If the skin is browning too quickly, cover with foil. Every so often, remove the excess fat from the base of the roasting tin with a small ladle or baster. Once the goose is cooked, put on a serving platter, cover completely with foil and leave to rest for 30 minutes. 4. For the gravy, remove and discard the vegetables and as much of the fat as possible from the roasting tin and put on the hob over a medium heat. Stir in the flour and cook for 2 minutes, then add the wine and simmer gently, whisking the cooking juices and caramelised bits into the wine. Pour into a saucepan with the blackberries, stock and jam; boil for 5 minutes, then reduce the heat and simmer for 8-10 minutes, until thickened to your liking; season. 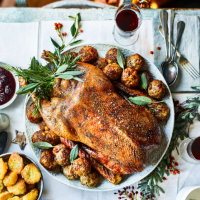 Serve the goose with the stuffing balls and gravy alongside, decorated with some small bunches of green herbs.